As we announced on the forums in December, standard cynosural fields will be moved to a new overview selection group in the upcoming February release. This will fulfil a common community request and allow players to filter cynosural fields separately from other beacons in their custom overview. In preparation for this change we created the new empty group early and made it available to be added to custom overview filters and shared overview packs. This group was automatically added to the default overview filters in December, and players can change their custom overview filters manually if they wish. The group is currently visible on Tranquility as “Future Home of Cyno Fields” under the “Celestial” category. In the February release the group will be renamed to simply “Cynosural Fields” and the cyno field items will be moved into it. 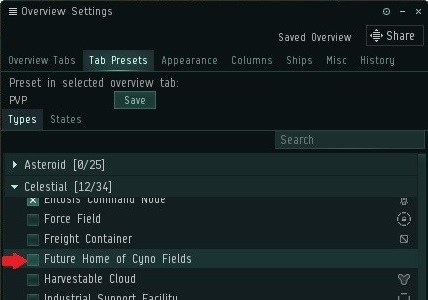 We encourage all players who use custom overview filters and who wish to continue seeing cynosural fields in those filters to add this new group to their custom filters before the deployment of the February release next week.